In Tribe LASIINI, previously PRENOLEPIDINI. Diagnostic Features - Dorsal surface of head, alitrunk and gaster with distinctly paired coarse hairs. Eyes well developed and set at or in front of the mid-length of the head. No ocelli. Antennae 12-segmented and inserted close to the posterior margin of the clypeus. Anterior clypeal margin entire or weakly emarginate medially. Mandibles narrow, with five or six teeth. Palpi long. Propodeum unarmed. Petiole a reduced scale inclined forwards and often overhung by the first gastral segment, always unarmed above. Acidopore borne on a conical projection of the hypopigium, and surrounded by a fringe of hairs. 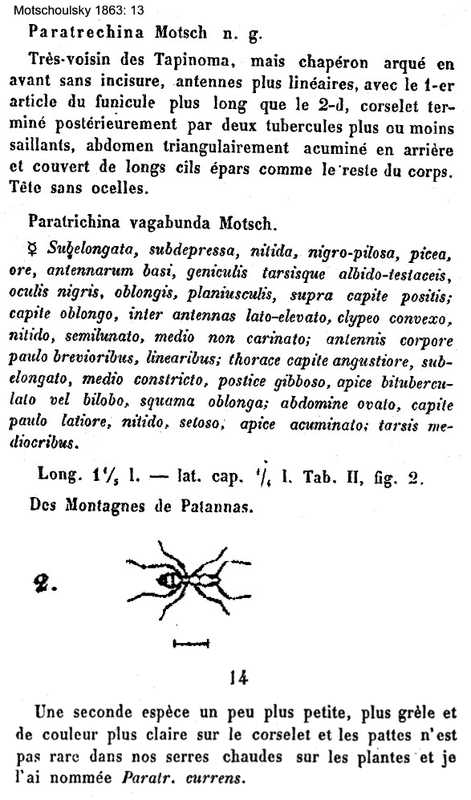 Bernard (1952) writing of the Tribe LASIINI, described these as small, very specialised, terricolous ants, showing polymorphism. The larvae have a reduced buccal apparatus and are fed on alimentary fluids, notably the exudate of Homoptera, which the ant workers often raise in the nest. Most have a vast geographic distribution. Motschoulsky's (1863) genus definition is at . See key by Emery (1910a: 127) at (P. flavipes is from Japan). Note: La Polla, Brady & Shattuck (2010a) wrote a quite dramatic revision, with good evidence from molecular phylogeny. LaPolla, J.S., Brady, S.G., & Shattuck, S.O. 2010a. Phylogeny and taxonomy of the Prenolepis genus-group of ants (Hymenoptera: Formicidae). Systematic Entomology, 35, 118-131. In their Taxonomic History, they state - "Motschoulsky (1863) described Paratrechina based on Pa. currens (which is now a synonym of Pa. longicornis Latreille, 1802) but the genus received little attention and was synonymized with Prenolepis by von Dalla Torre (1893). 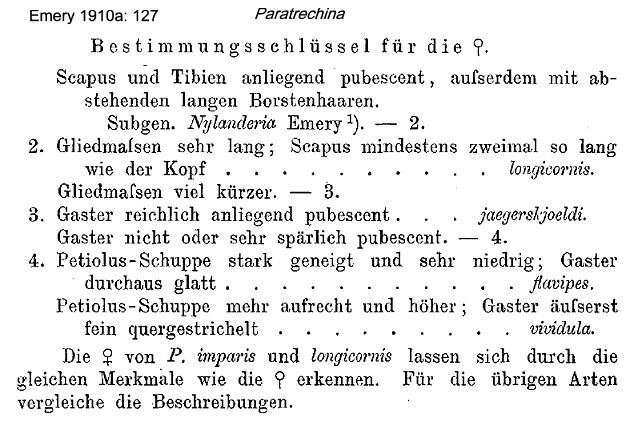 Emery (1925) removed Paratrechina from synonymy with Prenolepis as part of his world species catalogue, and it was at this time that many species were transferred to Paratrechina from Prenolepis". From that, as "Paratrechina longicornis" represents a distinct lineage and is the type species, Paratrechina is redefined as a monotypic genus. Looking in great depth at all the available evidence, I (BT) concluded their assessment was fundamentally flawed. Of primary importance is the actual Motschoulsky description (see link above). The species described fully, with an illustration, is Paratrechina vagabunda. If anything, it is longicornis that is the aberrant form. So, I have retained the following species as Paratrechina. On, for example, Antweb, many species are listed as in the genus Nylanderia. For more on this, see http://antsofafrica.org/ant_species_2012/paratrechina/paratrechina/paratrechina.htm. I have been told on good authority that the type specimens of P. vagabunda survived in Moscow and were lent some four years ago to Dr LaPolla. Conicidentally, I had been sent ants from a location in Sri Lanka (Ceylon) close to where the types were collected and felt that among them were specimens that matched Motschoulsky's P. Vagabunda - see http://antsofafrica.org/ant_species_2012/paratrechina/paratrechina_vagabunda/paratechina_vagabunda.htm.